Compost has never been my thing. I'm an active gardener who loves to utilize natural practices, but I forget to turn the pile and it always turns out too dry, too wet, or too warm. When we moved to our homestead and became much more dependent on our vegetable garden, my husband graciously took over the compost pile duties. His dedication to the task has produced the beautiful black, earthy, crumbly substance responsible for making our herbs and vegetables flourish. Like most organic gardening concepts, compost production can be somewhat controversial. Some gardeners are very particular about what should and should not go in the pile, and how the pile should be managed. However, everyone agrees on one thing: the end result should be black and crumbly with a pleasant, earthy aroma. Some may consider a few of my tips as “rule breakers”, but they have worked well for us and yielded consistent results. 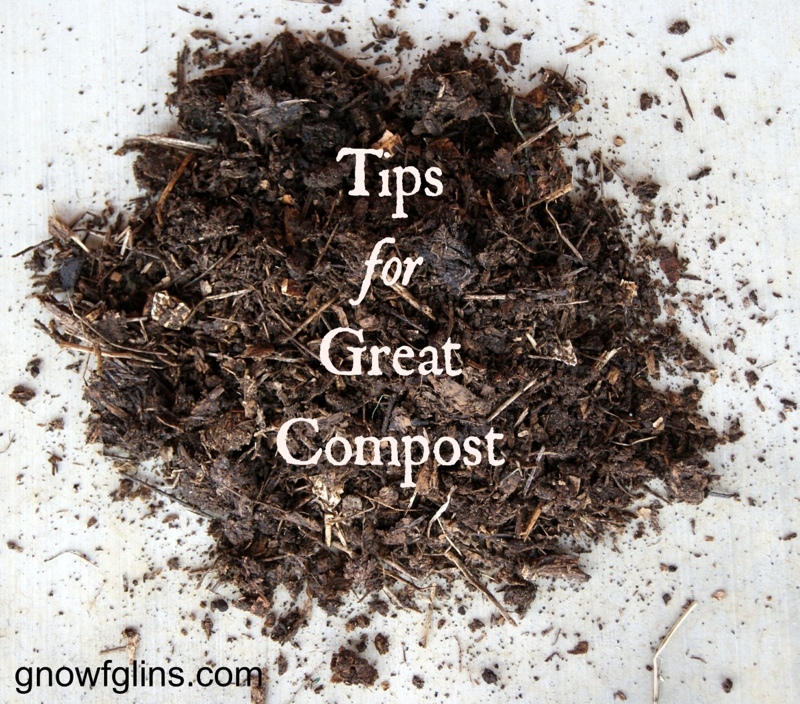 If you choose to begin a compost heap (and I hope you will) I encourage you to have an open mind and experiment, taking note of what works best in your climate and garden. 1. Select a good spot. Choose a spot outside with convenient access to your home and your garden. Compost can be piled on the ground or in compost bins, which can be as simple or complex as you like. Ours are comprised of slats with space in between for good aeration. We have two: one for a compost pile in progress, and one for a finished pile ready to be used in the garden. One of our rule breakers. This is primarily for the purpose of attracting heat to the pile. While decomposition will happen on its own in any environment, heat will hasten the process. In order to attract heat to the pile we use a large heavy piece of black plastic. Moisture will help speed up decomposition. When our compost pile is on the dry side, my husband grabs the hose and wets it down. Take note: as mentioned, good compost doesn’t smell bad. It has a nice, earthy aroma. If your compost pile becomes too wet, it will begin to smell rotten. It may take some trial and error to figure out the right amount of moisture for your pile. This is another way to get faster decomposition. We have found that weights compact the particles, keeping them in close contact with the bacteria that makes everything happen. We use concrete blocks placed on top of the pile. 5. Turn every so often. Turning helps to aerate the mix and keep it from becoming too compacted underneath the weights. It also helps to combine the older, decomposed bits with the fresher, lesser decomposed bits for a more homogenous mixture. As to frequency… honestly? We turn it whenever we think about it. Consistency would be the key, however — whether it is once or twice a month or whatever pattern you choose. 6. Keep a good mix. A blend of the following types of ingredients are perfect for the pile: freshly cut grass or freshly pulled weeds that haven't gone to seed (these are considered “green” items); leaves; and kitchen scraps — like vegetable peelings, tea bags, coffee grounds, and egg shells. On the other hand, avoid adding these to your pile: grease, meat scraps, chemically treated grass clippings, or dog and cat manure. Do you compost? What are some of your tips for getting great results? I follow the benign neglect rule. It gets watered if a plant next to it needs to be watered. It gets turned when I have already used the available compost and need more. I know I could be more efficient, but since it gives us what we need, I don’t bother. I also like that composting keeps our trash level and trash bag usage down. Keeping it near the house is key. I used to have mine further away and not only neglected tending it, but I also neglected to put things in it out of laziness. It never smells bad. I use two large tough plastic lidded trash cans with holes drilled around the sides for aeration–one getting filled and one already filled and decomposing until the other is full or I’m ready to use it. I can drop them on their sides to give them a roll/turn now and then. Since it’s just my husband, a toddler, and me, I have to supplement our kitchen scraps to get a good batch. Luckily we have a ton of oak trees on our property that constantly need trimming. I like to find spots where deer or rabbits have hung out to collect droppings to add to my bins, too. Sounds gross, but man, it is good for your garden. A big score occurs after a huge patch of sunflowers dies at the back of our property and I can break down all the dried canes for great mulch or addition to compost. You run the risk of seeds when adding plant material, but if the seeds germinate, which is unlikely after the composting process, the soil will be so soft and airy that it will be easy to pull unwanted seedlings. Drop them right into the compost as well. Sometimes it’s fun to allow a volunteer seedling to carry on if you recognize what it is and want it to grow. I get a lot of tomato, zucchini and cucumber plants this way. I love composting almost as much as gardening. It’s exciting to know I created the soil our plants thrive in and saved us a bunch of money. We live on the Tx coast–nothing but sand–and would need to buy loads of dirt if it were not for composting. Thanks for sharing Jennifer! My first compost bin was also a plastic garbage can with holes drilled in the sides. I agree that an added benefit is reduced trash.. I keep a small bin underneath the kitchen sink. Into that I empty all my kitchen scraps, tea bags, egg shells, etc. Once a week that gets taken out to the big pile back behind the garden. I have a container specifically made for composting—layer food stuffs with dirt, leaves, grass clipping or pine needles occasionally…also a benign neglect sort of person–I turn it into my garden once a year when harvest is done….My question is–how much damage do all the mice that get in do? Do they eat everything of value? also–my son didn’t know any better and dumped used cat litter (non-organic) in it one year–I took out everything I could see and one layer deeper–was that enough? or did I put poison in my garden the next year? Patti: I really don’t know. As far as the cat waste, if it happens again and you have concerns, use it on your ornamentals and not your vegetable garden. You might also try contacting your county extension office and see if there is someone there who can give you some advice. Good luck with it. Great tips. May I suggest adding two more? Chop up everything you place in the pile as small as possible first. [Maybe run through a chipper (if you have one) once or twice.] Second, always add an inch of chopped green material followed by an inch of brown. [Brown would be autumn leaves, cardboard, straw, paper, etc. Just layer both colors like a lasagna!] Most importantly, grin as you work and think about your happy veggies. What do you do with your compost pile in the winter. Soon it will be cold and snowy in Chicago and I have my compost in a black trash can. I have been working on it since early summer. Do I just let it sit until spring? Judy I would just make sure that it is covered and let it go until spring. Good luck with it! We dumped everything from the yard in two piles….that which would compost and branches and stuff that needed to be hauled to the greencycle dump. After about 20 years the grandkids were looking for worms and “discovered” a fabulous pile of compost. Now that I am retired, it is an incredible resource for my gardens. I continue to dump stuff on top including chicken manure. The chickens do a pretty good job of “turning” the top layers and the worms are abundant. I have even used it instead of soil when I needed to. Tomatoes love it. Kitchen scraps are dumped on top of the pile and the chickens get first dibs. What is left they scratch into the mix. I have a rotating compost bin that does a great job of attracting heat and breaking down my compost materials, but it stays wet constantly. I’ve tried leaving the “door” off to dry it out, but it’s a small opening and doesn’t seem to help. Likewise, the opening is so small I don’t think rain is getting in. Every time I have dry material like newspaper or cardboard egg cartons, I rip them up and add them in but they immediately get soaked and don’t seem to have a drying effect. I’m also thinking about taking the bagger off my mower and letting the grass clippings dry out for a few days then adding those in. My compost is the consistency of something you might pull out of a clogged drain. Any suggestions would be greatly appreciated! I have a compost bin and add to it almost on a daily basis. I live in Wisconsin and would like to continue to add to it all winter long. Is this okay to do or do I need to cover it and start again in the spring? Thank you for any advice you can offer me. Annie that should be just fine to add to it all winter long. It may take longer for it to break down but there is no reason why you can’t keep going with it. I have a garden and like to use compost. For many year’s i have gone according to the book. It always says to make sure you turn it at least once a month. Well, this year i was lazy with a lot of other projects going on. So, i turned it once and let it lay. To my surprise when spring came by, i had the best compost ever. It looked like good, sweet smelling dirt with no bad odor. And to top it off, I had zillions of little babies to put on my garden. Normally when i turn the compost several times before spring i would only have a little portion of good compost and the rest was still in food matter that stunk that no one would want to be around. Anyway, for me and i am sticking to letting the compost sit without turning and let the worms do the rest.